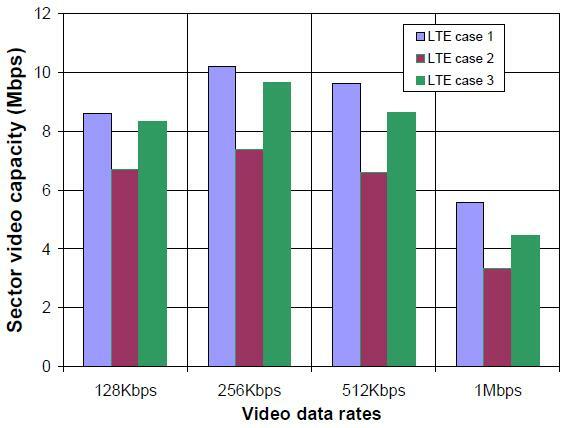 The Challenge of HD Video Streaming on LTE « Steven J. Crowley, P.E. One of AT&T’s non-redacted arguments in support of its acquisition of T-Mobile USA is that data usage on AT&T’s network is projected to “skyrocket by a factor of eight to ten” over the next five years due in part to streaming HD video. AT&T’s vision is that T-Mobile’s resources would be used to relieve resulting capacity restraints. Enabling an HD streaming service will be challenging because of the relatively-high and somewhat-constant bit rates required in a fading radio environment. Wondering how practical this is, I recalled a paper Motorola prepared last year reporting some of its simulation results on mobile broadband streaming video. In one set of simulations, Motorola assumed a 10 MHz bandwidth LTE system with 2 transmit antennas at the base station and 2 receive antennas at the mobile terminal. It assumed video was the only traffic. It tried four different video rates, each under three different deployment cases. (Deployment cases are separate assumptions for frequency, distance between base stations, path loss, and speed of user motion.) The results are shown below. The left axis shows sector video capacity. This is the total video data downlinked from a base station sector. At a video rate of 256 kbps, the sector capacity reaches a maximum of about 10 Mbps; this means 40 users could be accommodated with individual streams. Unfortunately for the HD proponent, sector capacity starts to fall quickly as the video data rate is increased. This is because it’s proportionately harder to guarantee a constant stream of data as the rate goes higher. An increasingly inordinate amount of system resources goes into keeping higher-rate streams up over a fading radio channel. This isn’t readily apparent unless one performs dynamic system-level simulations using realistic video traffic models and a detailed model of the LTE air-interface, as did Motorola. Let’s make an aggressive assumption of 1 Mbps per HD viewer (think high-resolution, but not-so-good quality, video on a notebook or tablet). The sector capacity drops to about 5 Mbps, accommodating five users. One can try trading off HD bit rate and number of users, but there’s little room to maneuver. Motorola didn’t look at 2 Mbps video, but looking at the figure, one might be down to one user per sector at that point. Going the other way, at 512 kbps I might get 20 users, but that’s not HD by any standard or convention of which I’m aware. Interestingly, in addition to seeing sector capacity drop at rates above 256 kbps, Motorola also saw it drop below 256 kbps. It says this because of overhead in transport and network protocols, and because of constraints imposed by LTE control overhead that put a limit on the maximum number of simultaneously scheduled users. With 128 kbps per user, one could serve 60 users, which is more than the 40 users for 256 kbps. As Motorola observes, however, 256 kbps is likely optimal to maximize streaming-video revenue for the LTE operator, taking into account both video quality and number of users. This entry was posted on Friday, April 22nd, 2011 at 10:58 am and is filed under AT&T, LTE, T-Mobile, Video. You can follow any responses to this entry through the RSS 2.0 feed. You can leave a response, or trackback from your own site. Thanks for posting this! Exactly what I was looking for today. Here’s a link to a similar Motorola article that doesn’t require IEEE membership.